HOUSTON (CNNMoney) -- Microsoft chief executive Steve Ballmer made an impassioned technology pitch to the energy industry Wednesday, arguing that game-like devices and cloud computing can help meet the world's growing need for oil and power. Speaking at IHS CERA's annual energy conference, Ballmer said the energy industry faces many of the same challenges as the tech businesses -- namely meeting soaring demand that, in the energy business at least, is expected to surge 40% by 2035. "It clear that we're not going to be able to conserve our way into our energy future," Ballmer told the room full of energy industry executives and analysts. "The task will be to invent new ways to fuel factories, vehicles, homes and cities. It will be underpinned by information technology." The Microsoft chief said that technology can help conserve energy and improve the way the industry uncovers new resources. Ballmer demonstrated how Microsoft's (MSFT, Fortune 500) game console Xbox Connect and cloud computing can connect people from around the world and show their movements in a virtual reality, adding that these same technologies can greatly improve energy exploration and production. Technology can help model deep, complex underground energy deposits, for example, and present these findings simultaneously to teams around the world. That can reduce the time it takes to develop an oil well. Ballmer said that a partnership with the oil service company Baker Hughes (BHI, Fortune 500) using cloud computing has enabled the oil firm to slice the amount of time it takes to crunch numbers to increase oil well flows from nine months to 30 days. Cloud computing basically outsources the hard drive functions on individual machines to giant, centrally-located server farms, boosting efficiency and power. The energy industry can also boost results by using technology to less expensively store the reams of pictures and data it possesses and by using real-time data to better manage electricity flows. Ballmer also noted that Microsoft's own energy consumption is huge, and that the company is constantly working on ways to make its massive server farms more efficient. In fact, the size of these server farms isn't measured in square feet or dollars, he said, but rather in kilowatt hours of energy consumption. While the total energy consumption of server farms is going up as more and more data is brought online, the efficiency of them is greatly improving. 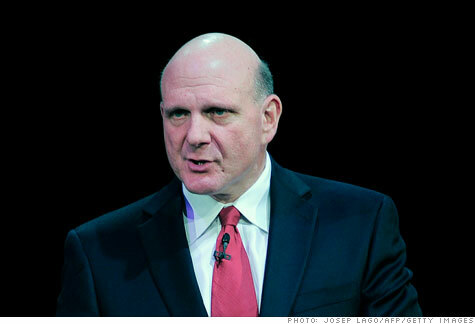 Ballmer said current server farms get eight times the output per kilowatt hour as the first generation. To the cloud! Wait, the what? The secret group setting the price of oil: Us.